In a recent MCA newsletter I mentioned the importance of routines. Since then, I’ve been thinking more and more about them. Ah… the metal element is working its wonderful magic on me! Let’s refresh. The metal element deals with autumn. It’s about learning to let life in and let life go. Just like an inhale and an exhale – we can’t have one without the other. Metal is also the element that deals with acknowledgment and grief. Yes, it’s a jam-packed element! Which brings me back to routine. I live a life of little routines. This comes in handy, particularly when raising young children. Routines help give my family structure. Think of it this way: if I poured a pitcher of water onto the beach, the water would go everywhere. But if I dig out trenches and give the sand structure, when the water is poured again it has a direction to flow. If I listed all the routines I have with my children between 6am to 8:30am it would make my head spin! However, I know this allows my kids and I and to have a much more peaceful morning, full of creativity and possibility. Not to mention everyone gets cleaned up, dressed, fed, and out the door to school. I heard a quote this past week that I’d like to share. To paraphrase: when you have a specific routine in place, you don’t ever have to start it over again. This is my goal with MCA. I hope to help create routines with my patients. It’s much easier to keep things moving than starting again from square-one, or when the body is in crisis. When patients come in for maintenance care, it makes treatment easier. A great example is my folks with sleep or allergy issues – when I treat them throughout the year, they are less affected when allergy season comes around. There can be a great deal of freedom in routine. Take a look at your life. Where is there chaos? How can a few routines help make your life more peaceful? When you uncover that chaos, breath deep. Just in doing so adds structure and creates a more peaceful you. The change in weather and heavy rains have reminded me of a simple remedy for keeping healthy. A patient came in today talking about how she was “bone cold.” It’s true: the rain and wind can trigger a bone-chilling feeling. When I get that feeling, I turn to ginger root. The result should be a bit spicy. You can always mix in honey to sweeten it up if you wish, or just add a bit of water if it’s too spicy. Sip this elixir throughout out the next day or two, and make more as needed. You’ll be feeling better in no time. In the June newsletter I wrote about my knee injury and how I realized I needed to change my behaviors around physical fitness and nutrition. At the time of my accident, I was operating under “false wellness”—that is, the idea that I was more in shape than I actually was. The recovery period has helped me understand how important getting back into shape is. As promised (to myself and to you!) I have been modifying my routine with wellness in mind, and I’m happy to share my notes! First let me say that I don’t measure health by weight or pounds lost—it’s not a great measuring tool because the scale doesn’t reflect the muscles I’ve developed or the fat I’ve burned accurately (remember, muscle weighs more than fat). I take measurements in inches—around my waistline, around my bicep, thigh, and upper chest muscles. It’s here that I can really see a difference! I was tempted to step on the scale when I noticed that my belt needed to be tightened to a different notch, and as it turns out I lost 5 pounds, but I’m more satisfied with the muscle gain. Nutrition-wise, I am sticking to a few good habits. I don’t eat after 8pm, and I take in more protein at breakfast (usually as a shake). Before, my low- or no-protein breakfasts left me hungry again by 10am or 11am. Now I am satisfied through lunch! I eat a sensible lunch and dinner and that’s about it! Because my knee isn’t back to 100% mobility yet, I’ve had to pace myself with my exercise plan. I do a lot of yard work andtake short walks, and have begun a super quick (but I won’t say “easy”) workout plan using this app called 7 Minute Workout. For seven minutes, I am prompted through a series of exercises that are not overly taxing on my body. 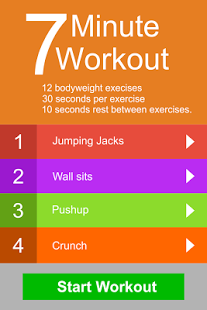 I love this app because I don’t need any equipment, or a gym membership, and I can do it any time. We can agree that we all have seven minutes to invest in our health, right? Watch this video or download the free app from the iTunes store. What do you do to stay fit and healthy? If you have simple ideas let us know so we can share them within the MCA community.